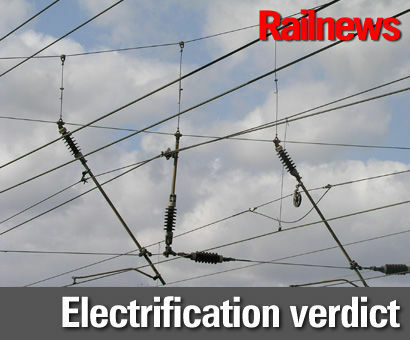 THE costs of Great Western electrification have risen by more than £2 billion since 2013 to reach a total of £5.58 billion, according to the National Audit Office, which says the project now needs to be 'reconsidered'. In response, the RMT union has claimed the report demonstrates that the Department for Transport is not 'fit for purpose'. The NAO says electrification between Maidenhead and Cardiff alone is set to cost £2.8 billion, plus a further £433 million for the extension to Swansea and some related schemes. The full total also includes other upgrades, such as the £763 million which has been spent on rebuilding and enlarging Reading station. Capability and capacity works for new trains will cost another £258 million, while Bristol area signalling and also track quadrupling at Filton Bank, between Bristol Parkway and Temple Meads, will account for £318 million more. In a damning report, the NAO accuses the Department for Transport of failing to 'plan and manage all the projects which now make up the Great Western Route Modernisation industry programme in a sufficiently joined up way'. The NAO, which is the official independent auditor of state spending, is now calling for the extent of electrification to be 'reconsidered', just 24 hours after rail minister Paul Maynard revealed that several schemes within the project are being placed on hold in a bid to save around £150 million. Places left out of the project for the time being include Oxford, Bath and Bristol, but the NAO has calculated that delays to the electrification programme will cost up to £330 million. NAO head Amyas Morse said: “The modernisation of the route has potential to deliver significant benefits for passengers but this is a case study in how not to manage a major programme. The Department's failure to plan and manage all the projects which now make up the Great Western Route Modernisation industry programme in a sufficiently joined up way, combined with weaknesses in Network Rail's management of the infrastructure programme, has led to additional costs for the taxpayer. RMT general secretary Mick Cash said: "Following on from the daily franchising fiasco on Southern, this NAO report once again underlines that a succession of ministers and senior officials at the Department for Transport have completely lost control of our railways and questions now have to be asked as to whether the Department is currently fit for purpose. RMT firmly believes that it is not." The first section of GWML electrification, between London Paddington and West Ealing, went live 20 years ago this month. This paved the way for the launch of Heathrow Express in mid-1998, after a further section of main line electrification had been completed to Hayes and energised in March 1997. Electrification onwards from Hayes to South Wales was announced by the DfT on 23 July 2009. The cost of the work, including the lines to Oxford and Newbury and also a route between Liverpool and Manchester, was put at a total of £1.1 billion. Great Western electrification through to Swansea was set to be completed 'within eight years'. © Copyright 2019 Railnews Limited.